The leader of the Freedom Conservative Party launched his party’s campaign in Calgary on Thursday with a promise that Alberta would drop out of the federal equalization program if he becomes premier. The leader of the Freedom Conservative Party launched his party's campaign in Calgary on Thursday with a promise that Alberta would drop out of the federal equalization program if he becomes premier. 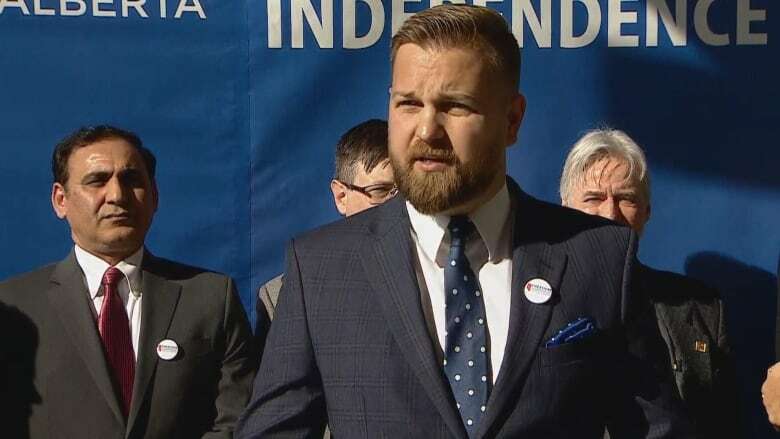 Derek Fildebrandt said that policy is part of the FCP plan to fundamentally change Alberta's relationship with the federal government. "Only the Freedom Conservative Party is dedicated to breaking the grip of Ottawa and putting Alberta first," he said as he unveiled the first plank of his party's platform at the Bridgeland Community Association in northeast Calgary. Fildebrandt also promised the FCP would demand that Alberta be allowed to collect its own taxes, control policing in the province and control immigration. "I am tired of Alberta being treated as a second-class colony," he said, promising that if major changes don't happen soon, his party would also hold a referendum independence for Alberta. He summed up his first policy announcement as, "More Alberta, less Ottawa." The FCP bills itself as "a coalition of grassroots conservatives, libertarians and Alberta patriots." Fildebrandt says that means the party is against "big government socialism" as well as "big business corporate welfare." "Instead, we embrace a brave new future for Alberta," he said. "We embrace a conservatism that isn't just for small government in business and your wallet, but small government in every part of everyone's life. Our fundamental philosophy is that if you are not hurting anybody else, it's not the government's bloody business." Fildebrandt, the sitting MLA for Strathmore-Brooks, said Wednesday that he expects to field roughly 30 candidates in the election, which is set for April 16. He says the party has been careful to field candidates only in ridings where the NDP has very little chance of winning so that the UCP and FCP don't split the vote. Fildebrandt also threw barbs at UCP Leader Jason Kenney over the co-called kamikaze affair — allegations that Jeff Callaway's campaign for the UCP leadership was little more than a collaborative effort with Kenney's team to attack their mutual opponent, Brian Jean. Fildebrandt said politicians are humans and make mistakes and should admit them, yet Kenney has blamed everyone but himself for the controversy. Fildebrandt first won his seat in the Legislature in 2015 as a member of the now-defunct Wildrose Party. When that party merged with the Progressive Conservatives to form the United Conservative Party, he stayed in the caucus until 2017. He then left to sit as an Independent. A year ago, he was told he wasn't welcome to rejoin the UCP, and went on to establish the Freedom Conservative Party in July 2018.